It's so easy and quick, it serves a lot, most people really like it, and there are endless flavor combinations! And it can be made ahead of time, perfect for parties! You could definitely serve this on an oreo crust if you prefer, but I really like the brownie texture. Preheat the oven to 350�F. Grease and flour (or spray with baking spray) a 9 x 9 square or 10" round springform pan. Melt the butter and stir in the cocoa powder. Cover, and set aside to cool. Using an electric mixer, beat the eggs for 3 minutes (longer if you're using a hand mixer), then gradually add the sugar, beating 2 to 3 minutes more. Stir in the butter/chocolate mixture. Gently fold in the flour and salt, just until combined. Pour the batter into the prepared pan. Bake for 18 to 20 minutes, until a toothpick comes out clean or with just a few crumbs. Cool completely. Be sure to have all ingredients at room temperature, especially the eggs and cream cheese. This will help keep cracks from forming in the top of the cheesecake. Preheat the oven to 325�F (if you're doing the cheesecake the next day; otherwise just reduce the oven temperature). Put a kettle of water on to boil for the water bath. Wrap springform pan in 3-4 layers of aluminum foil to prevent (or lessen at least!) leakage. In a stand mixer with the paddle attachment, beat the cream cheese at medium speed for about 4 minutes, until soft and creamy. Add the peanut butter and beat for another 2-3 minutes. Add the sugar and beat for another 4 minutes. Beat in the salt and vanilla. Add the eggs, one at a time, beating well (about 1 minute) and scraping sides of bowl after each addition. Beating at low speed, add the sour cream and heavy cream. The batter will be thin. (Note: If you're using a hand mixer, you will want to increase the mixing times). Pour the remaining batter on top of the cooled brownie base. You'll want to leave a little room (half-inch or so) at the very top of the pan, but it should be nearly full (depending on your pan size and your base, you may have a little extra batter which can be cooked in small cake pans or muffin tins). Place the cheesecake in the pan for the waterbath, and place in the oven. Pour the boiling water in for the water bath, it should come about halfway up the side of the springform. Bake the cheesecake for about 55-65 minutes: it should hold together and appear set at the edges, but there will still be a lot of jiggle in the center. Turn the oven off, and leave the cheesecake in the oven for another hour. After one hour, remove the cake from the water bath, and let it finish cooling on the counter top. Remove the foil, and refrigerate overnight. Place the chopped chocolate in a medium-sized bowl. Bring the heavy cream to a boil, and pour over the chocolate. Let sit for one minute, then stir until smooth. Let the ganache cool to lukewarm or even room temperature, and then pour over the chilled cheesecake. 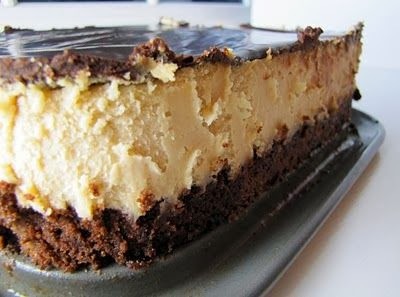 Spread the ganache evenly over the entire cheesecake, and return to the fridge to set. Bring the cheesecake to room temperature before serving. Run a thin sharp knife around the edge of the spring form pan before removing the outer rim of the pan. A warm knife works best for cutting the cheesecake, you may want to wipe it clean between slices. 1. The water bath greatly helps prevent cracks in your cheesecake, because it makes the cheesecake cook more slowly. The problem is that water almost always leaks into the springform pan. You can use a regular cake pan, rather than a spring form - no leaks, but you have to flip the cheesecake out, and then flip again to make it right side up. That's kinda scary. When using an oreo or brownie base, the small amount of water that leaks in can make the crust a little fudgier which I like. So I usually use the water bath, and wrap it with at least 3 layers of aluminum foil. 2. It's very important to have all ingredients at room temperature. Take the eggs, sour cream, and cream cheese out of the refrigerator way ahead of time. But, of course, life happens, and sometimes you forget! You can fake it if you have to: let the eggs rest in warm water for 10-15 minutes to bring them to room temperature. You can also microwave the cream cheese (not too much! use 5-10 second increments and low power) to bring it to room temperature. 3. Don't overbake the cheesecake. The middle should still jiggle a lot when you turn the oven off. 4. Some people swear by just reducing the oven temperature and letting the cheesecake bake for longer (with no water bath). I've never tried this method, but let me know if you do! 5. Cracks come from quick and drastic temperature changes. The water bath keeps the cheesecake from baking too quickly, and leaving the cheesecake in the oven keeps it from cooling too quickly. Placing a warm cheesecake in the fridge may also cause cracks. 6. Even if it cracks, it still tastes great, so don't worry about it! And if it really bothers you, make a sour cream or chocolate ganache topping and cover it up. No one will ever know.